Just a few weeks ago, we reported that Gal Gadot—Batman V. Superman‘s Wonder Woman—was in talks to play the female lead in Timur Bekmambetov’s Ben-Hur remake. We made a joke about directors who put everything in slow-motion, we talked about how weird it is for a movie’s central love story to be based on one person literally owning the other person, and, all in all, we had a pretty good time. According to a new report from The Wrap, though, we did all of that for nothing. 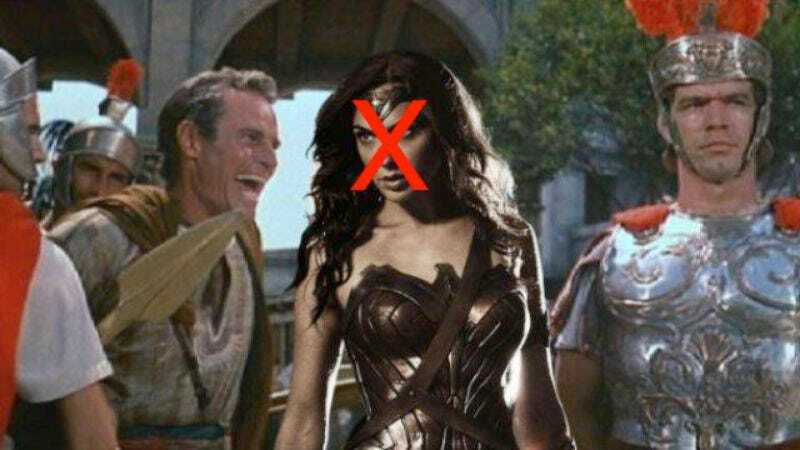 That’s because Gal Gadot has now apparently passed on Ben-Hur due to scheduling conflicts with filming Zack Snyder’s big superhero punch-a-thon and “all that playing Wonder Woman entails.” We’re not sure what that last part means, but it probably has something to do with going off to live on Paradise Island away from the evils of men and their constant remakes. Jack Huston and Morgan Freeman are still set to appear in Ben-Hur, provided they don’t also come up with scheduling conflicts related to all that playing Wonder Woman entails, so now MGM and Paramount just need to find a new actress to play the female lead. Maybe Scarlett Johansson can do it? Black Widow still isn’t getting a solo movie, so she won’t have any prior commitments to worry about.